The Tecnam P2006T is a light, twin engine, four-seated cantilever high wing airplane, aluminium construction, with fully retractable tricycle landing gear, built by Tecnam. Costruzioni Aeronautiche TECNAM S.r.l., of Capua, Italy, was founded in 1986 by the Brothers Luigi and Giovanni Pascale (formerly Partenavia). Tecnam entered the MLA-market with the P.92 Echo and designed and built over the years a range of MLA and VLA aircraft like the P96 Golf, P2002 Sierra and P2004 Bravo. In 2006, Tecnam started with development and design work of a new twin propeller aircraft named P2006 VELT (Very Light Twin). The prototype, Tecnam P2006T c/n 1 I-TETW, flew first on 13 Septemeber 2007. A first look at the Tecnam P2006T gives obvious the lines of the Partenavia P68 Oscar, not entirely inexplicable as the design is performed by the team of Prof Luigi Pascale. The P2006T is powered by two 73 KW or 100hp Bombardier-Rotax 912 S3 four-cylinder geared piston engines. The MTOW of the P2006T is 1230 kg with an empty weight of 800 kg giving an useful weight of 430 kg. Basic aircraft equipment configuration of the twin engine propellor aircraft allows VFR Day operation. Additional equipment configuration is available at customer choice. 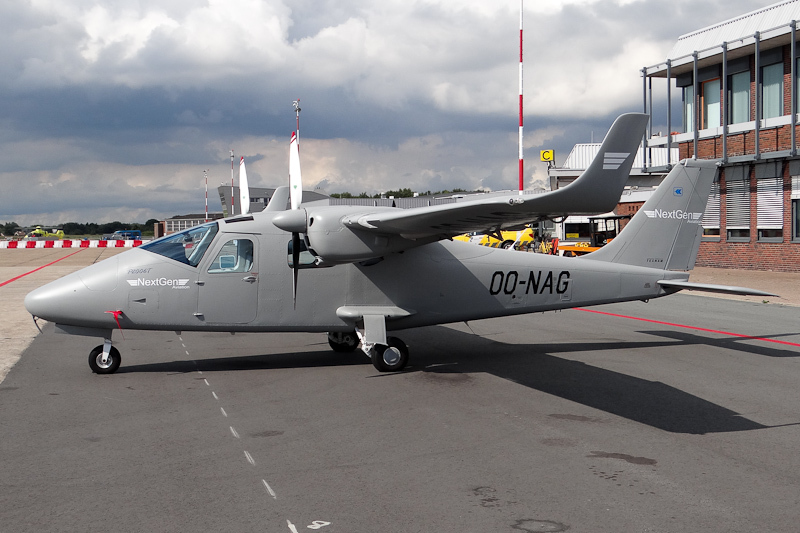 On 3 June 2013, Tecnam P2006T c/n 111 was registered OO-NAG in Belgium with NextGen Aviation Group, Deurne. When, on 9 September 2013, the 2013-built Tecnam P.2006T OO-NAG landed at Groningen Airport Eelde in the Netherlands, it was a first visit of type.